Helius Medical Technologies, Inc., a medical technology company focused on neurological wellness, announced results from its registrational trial evaluating the safety and effectiveness of the Portable Neuromodulation Stimulator (PoNS™) for the treatment of subjects with chronic balance deficits due to mild-to-moderate TBI. 5 weeks of treatment (2 weeks in-clinic and 3 weeks at-home) consisting of physical therapy and either a high-frequency PoNS™ device (active) or a low-frequency PoNS™ device (control). Endpoints for effectiveness were assessed using the Sensory Organization Test (SOT), measuring balance using computerized dynamic posturography. A responder rate analysis was used for the primary endpoint. A responder was defined as a subject with an improvement of at least 15 points on the composite SOT score compared to baseline after 5 weeks of PoNS™ Therapy. Secondary effectiveness endpoints were contingent on the outcome of the primary endpoint and determining the clinical effectiveness of the low-frequency device. As the low-frequency device demonstrated, on average, statistically significant improvements on composite SOT scores compared to baseline (p<0.025) – the secondary effectiveness endpoints evaluated for the study were the mean change in composite SOT score from baseline at 2 and 5 weeks, for both arms combined. Helius is building upon almost 40 years of scientific research on neuromodulation, early pilot projects and case studies performed at the Tactile Communication and Neurorehabilitation Laboratory (TCNL) at the University of Wisconsin in Madison. Most recently, a study at the University was conducted to evaluate what happens when responders to PoNS™ Therapy stop treatment. The results showed that, on average, subjects with compromised balanced who restored vestibular function to normal levels after 14 weeks, maintained their improvements even after 12 weeks of wash-out. The PoNS™ is an investigational, non-invasive, wearable medical device designed to deliver neurostimulation through the tongue. Clinical research has shown that electrical stimulation of the tongue activates two major cranial nerves – the trigeminal nerve and the facial nerve. Electrical stimulation of these cranial nerves creates a flow of neural impulses that are then delivered directly into the brain stem and cerebellum. PoNS™ Therapy combines the use of the PoNS™ device with physical therapy. Helius Medical Technologies is a medical technology company focused on neurological wellness. Helius seeks to develop, license and acquire unique and non-invasive platform technologies that amplify the brain’s ability to heal itself. 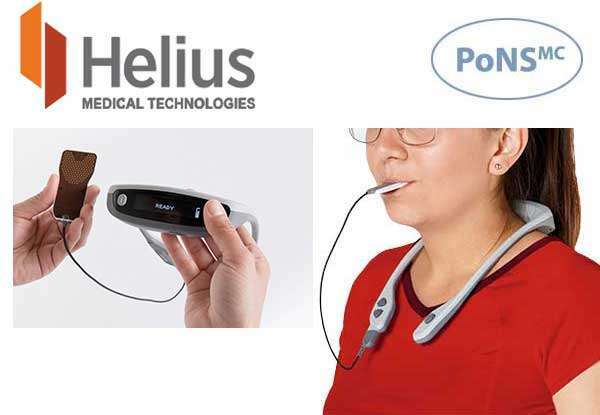 Helius intends to file for FDA clearance for the PoNS™ device. For more information, please visit www.heliusmedical.com.